Oil & gas fields are becoming more and more complex. Production facilities and reservoirs interact with each other. The quality and quantity of instrumentation is increasing, with down hole monitoring and multiphase metering. Companies are looking at implementing real-time reservoir control through building digital twins of the entire field. SIRIUS’ beacon project in digital field and reservoir project applies our skills in semantic technology, data science and scalable computing to improving how computers support modern field management and petroleum technology. SIRIUS is working with Equinor on how the computational performance of reservoir simulators can be improved. The multi-phase flow in oil & gas reservoirs is very complex and is modelled by a large system of nonlinear partial differential equations. High resolution is needed in reservoir simulations to resolve these flow phenomena. This leads to large amounts of computation that can only be properly handled by parallel computing platforms. Moreover, optimization and statistical analyses require repeated calculations. We need efficient high-performance computing. Most reservoir simulators are proprietary systems. This has hindered swift development of HPC techniques. The OPM initiative (https://opm-project.org), however, represents a new community effort to promote openness in reservoir simulation research. OPM makes a number of real-world data sets openly available and coordinates collaborative development of open-source software for simulating porous media processes, like reservoirs. An extensive software framework has already been developed in OPM. However, the current OPM reservoir simulator is not yet capable of achieving the full potential of modern parallel computing platforms. This is due to both imperfect components in the numerical scheme and mismatches between parts of the implementation and modern hardware architectures. A SIRIUS PhD project (Andreas Thune, supervised by Xing Cai (Simula), Alf Birger Rustad (Equinor) and Tor Skeie (Simula)) aims to enhance the HPC capability of OPM’s reservoir simulator. In 2018, Andeas rigorously tested and profiled the current reservoir simulator in the Open Porous Media (OPM) framework using an open data set. The numerical and parallel performance of the simulator, as well as the underlying code details were carefully studied. One essential numerical component in the numerical strategy was improved, leading to a considerable speedup of the workflow of Equinor’s reservoir engineers. The result is a substantial improvement in numerical behaviour and thus a considerable reduction in the computing time. These results were presented at the OPM annual meeting. This progress opens possibilities for Andreas’ ongoing research work, which will very likely lead to his first journal submission in the start of 2019. This work is internationally focused and Andreas visited The National Supercomputer Centre in Guangzhou, China, for one month in March-April 2018. As part of the Scalable Computing research program, this project provides important experience on programming and utilizing various modern platforms of parallel computing, including systems delivered by the HPC industrial partners of SIRIUS. Such experience is valuable for many of the other activities in SIRIUS. Moreover, the improved HPC capability of reservoir simulation will speed up the turn-around time and improve uncertainty quantification associated with the workflows of planning and operations in the oil & gas industry. SIRIUS has been working with the field management and petroleum technology groups in Equinor and Petrobras to identify IT challenges in digitalization of field development. 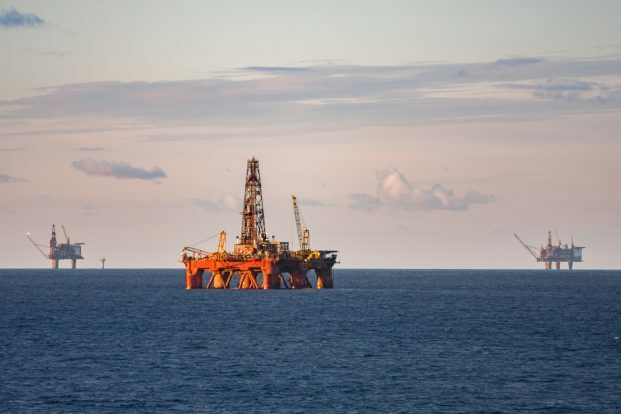 Complex greenfield developments, like Libra and Johan Sverdrup, and brown-field projects, like Snorre, face difficult field management problems. Improvements in production and recovery require combination of petrotechnical analysis and data science. These analyses build upon a set of data and models that together provide a digital twin of the whole field: reservoir, wells, flowlines and production facilities. The components of this twin are commercially available but are locked into commercial and technical silos. Retrieval of data is time-consuming and requires database skills. Integration solutions that work for a single application cannot be rolled out to other facilities. Differences in data and application landscape make it difficult to collaborate between disciplines for a single field and within disciplines for different fields. The digital twin idea looks simple in principle, as shown in the figure. We measure, simulate and predict. Challenges lie in the diversity of the data used, uncertainty of the data and models and in the wide variety of commercial, proprietary and tailor-made solutions in the workflow. Digital twins are difficult to build, scale and maintain. There is a danger that current ambitions for digital twins will result in too-complex systems that fail to solve business problems. SIRIUS has proposed a project that addresses these challenges by advancing the research front in IT so that usable, maintainable and scalable Field Management Digital Twins can be used by industry in 2024. 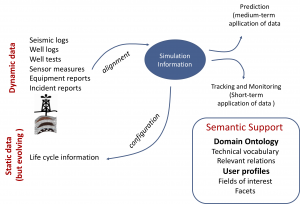 This research is interdisciplinary and focuses on petroleum-relevant IT disciplines: data semantics, analytics and machine learning, database design, data access, integration of data, applications & APIs and management of streaming and real-time data. Both the Norwegian and Brazilian corporate partners in this project have already initiated ambitious plans for whole-field digital twins. The purpose of this project is to further build the petroleum-relevant IT knowledge that is needed to overcome the challenges in making digital twins useful and sustainable. This project has been prepared and proposed in collaboration with the Federal University of Rio Grande do Sul.